In a multicultural society bound by submission to political correctness and “welfare,” a man must choose between living in a pack or living in a herd. Those who decide to join a herd have made the last decision of their lives, because they have decided to give the shepherd full control over their fates and minds. Those who decide to join a pack should know they risk becoming outlaws. 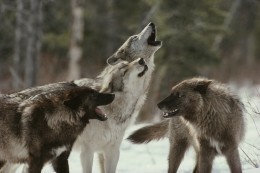 We who are members of the pack are the wild and free ones, and we must keep being this way. Our pack must be protected from other packs and, above all, from the Tamer, i.e., the coercive multicultural State, because nothing is more dangerous for the tribe than the State’s effort to disarm its sheep. Nationhood today is nothing more than contributing “utility” to a debased humanoid conglomerate confined within political boundaries. In the multicultural reality in which we live, our ancestors’ history has been erased, distorted, and, finally, rewritten as a black legend. How could we be loyal to institutions when the entire sociopolitical macrostructure hates our heritage? Let’s face reality. There is no communion. There is no community. There are just human beings subjected and forcibly unified by a State to serve the interests of alien elites. A man alone has interests, but no power to secure them. Only the small, homogeneous community, i.e., the tribe — a group of individuals united by common origins, common interests, and a common destiny — can hope to represent the interests of its individual members, and to defend the tribe is to defend the individual and his interests. The State, on the other hand, is aware of the menace embodied by the citizens with real power (i.e., armed, prepared for defense of the tribe). The State defends itself by inventing social forums and encouraging political processes that exhaust dissent and change nothing. We can vote for any preference as long as it does not fundamentally alter the system. We are encouraged to express our political opinions, as long as they do not fundamentally challenge the ruling hegemony. On the other hand, a sudden “popular” uprising — in other words, people led by a strongman, but not a revolution — only replaces the oligarchical-plutocratic rulers while the binding structure — the State — is maintained by dividing the tribes and uniting them in a society composed of atomized individuals. The State gathers the livestock (society) under the slogan “Unity makes Strength,” but before it can create this false unity, it must destroy and disaggregate tribes into thousands of individualistic atoms (“Divide and Conquer”). Worse still, not only does the State destroy the tribe/community through the imposition of a hedonistic/consumerist society, but it also disarms individuals, leaving them just defenseless prey of the almighty State predator. Who could resist? Deciding to arm ourselves against the forces that threaten us is part of our own individuality, our freedom. In simple words, it the only right that worthy men should embrace: the right to fight for his own survival. Gun control is not about guns, it’s about control. It’s about our legitimate right to self-defense being taken away from the citizens by the State. It’s about the trampling of the phylogenetic continuity of our community. Before you celebrate the triumph of social “progress” toward a peaceful and better world, ask yourself, in the name of your own freedom, whether or not a tribe that shares your values and responds to your interests is not a better means of securing social peace and public safety. 1. “To ravage, to slaughter, to usurp under false titles, they call empire; and where they make a desert, they call it peace.” — Tacitus, Agricola.